Not many players can claim to be a national hero, nor do many have as unique a place in World Series history as Edgar Renteria. 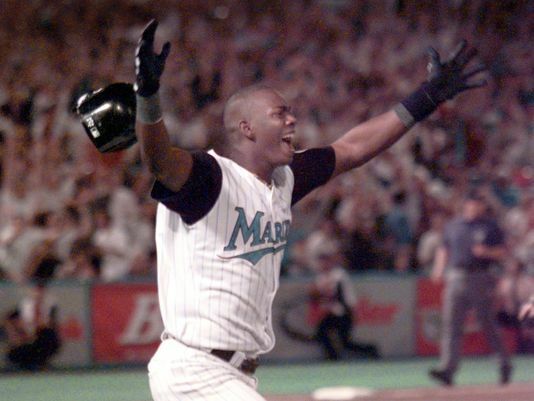 As a 21-year-old in 1997, Renteria hit an RBI single in the bottom of the 11th inning in Game Seven to win the World Series for the Florida Marlins. As a 28-year-old with the St. Louis Cardinals, Renteria grounded out to Keith Foulke of the Boston Red Sox to end the 2004 World Series. As a 34-year-old in 2010, he hit a go-ahead home run in the decisive Game Five en route to winning World Series MVP with the San Francisco Giants. Between his first and last World Series, Renteria established himself as the best-ever major-league player from Colombia and one of the best shortstops of his era. Edgar Enrique Renteria was born on August 7, 1975, in Barranquilla, an industrial city in northern Colombia located near the Caribbean Sea. He was the youngest of eight children born to Francisco and Visitacion. When he was one year old his father died, leaving his mother to raise the family alone. To survive, Edgar and his siblings sold coconut candy, fried pork rind, and raffle numbers. As a youngster he played chequitas, a Colombian version of stickball, in which players try to hit a bottle cap with a broomstick. He learned to play baseball from his older brother, Edinson, whom Edgar looked to as a father figure. Edinson played minor-league baseball for nine seasons as an infielder in the Astros and Marlins farm systems. At 11, Edgar started playing in Colombian youth leagues. He immediately demonstrated his major-league talent: His coach said he would dive at any ball that came his way and quickly jump up to fire off a hard throw.1 He neglected his schoolwork in favor of practicing baseball. At 16, Renteria was signed by the Marlins. From 1992 to 1996, he played in the Marlins farm system. Baseball America ranked him 51st among major-league prospects before the 1993 season and 33rd before the 1996 season. During his time in the minor leagues, Renteria was known to be reserved with his teammates, though he did speak English. Playing for Triple-A Charlotte, Renteria was called up on May 9, 1996, after Marlins starting shortstop Kurt Abbott was injured. He made his major-league debut on May 10 against the Colorado Rockies, entering the game as part of a double switch in the ninth inning. Renteria made his first start on May 18, 1996, at Wrigley Field. Facing Steve Trachsel with one out in the top of first, Renteria hit an 0-and-1 offering to left field for his first major-league hit. He started slowly, but showed enough for the Marlins to shift Abbott to second base upon his return. As his first major-league summer wore on, Renteria heated up, going on a 22-game hitting streak from July 25 to August 16. In August Cincinnati Reds general manager Jim Bowden called him the second-best shortstop in the National League, after Barry Larkin.2 Renteria concluded the season strong, batting .309 and finishing second in the Rookie of the Year voting to Todd Hollandsworth. Unhappy with low attendance, Marlins owner Wayne Huizenga decided to construct a team capable of winning the World Series. The Marlins spent $89 million before the 1997 season, adding Jim Leyland as manager, Bobby Bonilla and Moises Alou to the outfield, and Livan Hernandez and Alex Fernandez to the pitching rotation. Renteria started the 1997 season slowly, though there were highlights for him during the first two months of the season. On April 5 he hit an inside-the-park home run to tie a game against Cincinnati and won the game with an RBI single in the 11th inning. From May 13 to May 29, Renteria had a 13-game hitting streak. He performed better as the season went along, but failed to match his rookie-season batting prowess, finishing at .277. The Marlins won the National League wild card and defeated the Giants and Braves to advance to the World Series. In the aftermath of the hit, Renteria was hailed as a hero in South Florida, but the greatest acclaim came from his native Colombia, where he became a national hero overnight. Even though national elections in Colombia occurred the same day as Game Seven, the next day’s newspapers had headlines like “Renteria Wins in Miami.”4 His brother Edinson said that Edgar was nearly as adored in Colombia as Michael Jordan was in the United States. Colombia’s president said that Renteria showed the world a different side of the nation, rather than the violence-torn country depicted in the media, and he bestowed Renteria with the nation’s highest honor, the San Carlos Cross of the Order of the Great Knight. Renteria approached his newfound fame with humility, believing that he was not a hero, but just an athlete representing his country. Renteria spent the offseason at home in Barranquilla, basking in the aftermath of his shining moment. Immediately after the 1997 season, the Marlins began dismantling their championship team. As a result, expectations for 1998 were not high. Renteria began the season where he finished the 1997 season: batting second and playing shortstop. The Marlins won on Opening Day, but proceeded to lose 11 straight games. By the All-Star break, Florida was 32-55. Renteria was the only Marlin selected for the All-Star Game. Both he and the Marlins performed worse during the second half of the season. He finished with a .282/.347/.342 batting line, and 1998 was one of his worst seasons statistically. The Marlins finished with a 54-108 record, becoming the first defending World Series champion to finish dead last in their division. After the season, the Marlins traded Renteria to the St. Louis Cardinals. The Cardinals had coveted him for over a year, and were willing to pay a premium, giving up minor-league shortstop Pablo Ozuna and minor-league pitchers Braden Looper and Armando Almanza. Expectations for Renteria were high given his strong performance in his early 20s for the Marlins. On Opening Day 1999, Renteria started at shortstop and batted leadoff for the Cardinals, going 0-for-2. He hit his first home run for the Cardinals against the Los Angeles Dodgers on May 16, and even hit two home runs in a victory over the Marlins later in the season. Yet these moments were few in 1999 for Renteria as he endured a mediocre campaign. Despite hopes of making the postseason, the Cardinals finished fourth in the National League Central Division. The Cardinals made significant improvements going into the 2000 season, adding catcher Mike Matheny, center fielder Jim Edmonds, second baseman Fernando Vina, and starting pitcher Darryl Kile. Despite the influx of talent, Renteria was the team’s sole representative at the All-Star Game in Atlanta, being selected as an injury replacement for Mark McGwire. Despite a mediocre .278/.346/.423 batting line, Renteria won the Silver Slugger Award at shortstop. The Cardinals qualified for postseason play, winning the Central Division with a 95-67 record, but fell to the New York Mets in the National League Championship Series. They also reached the postseason in 2001 but bowed to the Arizona Diamondbacks in the Division Series. Renteria had a second consecutive mediocre season at bat (.260/.314/.371). Both Renteria and the Cardinals had better seasons in 2002. Renteria batted .305/.364/.439. His most memorable series of the season was a three-game set against the Chicago Cubs at Busch Stadium July 26-28. In the first game Renteria got his 1,000th career hit, off Cubs pitcher Jon Lieber, and in the third game hit a walk-off three-run home run to cap a six-run ninth inning for a 10-9 victory. Renteria’s season earned him Silver Slugger and Gold Glove Awards. The Cardinals led the NL Central Division for the third year in a row, but fell short of the World Series, losing the NLCS to San Francisco. In 2003 Renteria had his best season as a major leaguer, hitting .330 with 13 home runs, 100 RBIs, and 34 stolen bases. He became the only Cardinals shortstop since 1900 with 100 RBIs and the first National League shortstop with 100 RBIs since Hubie Brooks of the 1985 Expos. Renteria fell just six hits short of joining Honus Wagner as the only National League shortstops to get 200 hits and 100 RBIs in a season. Renteria thought the key to his success was batting sixth or seventh in the lineup behind many good hitters all season.5 Such a strong campaign earned Renteria an All-Star Game appearance and Silver Slugger Award and Gold Glove Awards. The Cardinals did not make the postseason in 2003, finishing third in the NL Central. 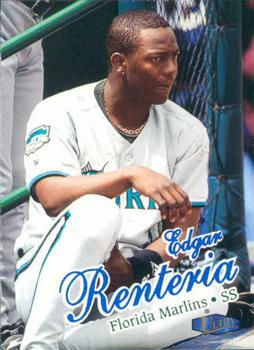 Renteria was due to qualify for free agency after the 2004 season. After a career year, his performance took a substantial step backward. Although the fans voted him into his second consecutive All-Star Game, Renteria struggled throughout the season, finishing with a mediocre .287/.327/.401 batting line. But it was a memorable season for the Cardinals, who won 105 games en route to the National League pennant. Renteria found himself one of two Colombian shortstops in the World Series, the other being Boston’s Orlando Cabrera. The people back home were excited, with a Colombian newspaper describing the Series as “Cabrera vs. Renteria.” Renteria told reporters he hoped the presence of two Colombians in the World Series would bring professional baseball back to Colombia.6 Notably, Cabrera and Renteria were not on good terms. Renteria believed that Cabrera had disrespected baseball people in Colombia working to improve the sport.7 Cabrera’s Red Sox got the better of Renteria’s Cardinals as the Red Sox swept St. Louis. Though Renteria had a good offensive Series, he made the final out of the game, hitting a weak grounder back to Keith Foulke, who threw to first to win Boston’s first title since 1918. After the season Renteria became a free agent. Though the Cardinals wanted to retain him, it was unclear whether there would be room in the club’s budget for him. In the end, the Cardinals offered Renteria a four-year, $39 million contract. But the Red Sox, in need of a shortstop to replace the departing Orlando Cabrera, offered a little more. On December 17, 2004, Renteria agreed to terms with Boston on a four-year, $40 million contract, becoming the starting shortstop for the defending World Series champions. Renteria had a nice two-year stint with the Braves. He bounced back in 2006, opening the season with a 23-game hitting streak, and batting .318 with nine home runs in the first half of the season. He was selected for his fifth All-Star Game, a feat he had never been happier about. Renteria continued his strong performance in the second half of the season, but despite his contribution, the Braves did not win the NL East for the first time since 1991. Renteria had another strong season in 2007, but the Braves again failed to make the postseason, finishing in third place in the NL East. With top shortstop prospect Yunel Escobar ready to play every day in the major leagues, the Braves no longer had a spot for Renteria to play. They traded him to Detroit, reuniting him with Dave Dombrowski and Jim Leyland, the general manager and manger of the 1997 Marlins. In addition to Renteria, the Tigers also acquired Miguel Cabrera and Dontrelle Willis from the Marlins that offseason, bolstering the lineup and rotation with the expectation of a return to postseason play. But neither Renteria nor the Tigers had strong 2008 campaigns. Renteria regressed after two strong seasons and the Tigers finished the campaign in last place. After the season the Tigers declined Renteria’s option and chose to not offer arbitration, making him a free agent. 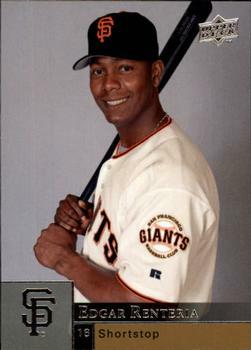 Renteria signed with San Francisco on December 4, 2008, for two years and $18.5 million, with an option for 2011. The Giants felt that his 2008 season was an aberration. In the face of questions about whether the 32-year-old could still succeed in the majors, Renteria said in spring training that he expected to hit better in 2009 because he endured a poor clubhouse environment with Detroit in 2008 and had a decade-plus of major-league experience.9 Though the Giants expected Renteria to be an upgrade at shortstop, he was one of the worst players in baseball in 2009. His batting line was a meager .250/.307/.328 and he played poor defense. Renteria reported to spring training in 2010 excited to be healthy again and eager to make amends for his dreadful 2009 campaign. But he struggled again in an injury-marred 2010, leading Giants fans to call for him to be benched.10 The Giants qualified for the postseason and advanced to the World Series. Renteria did not start during the Division Series, but was inserted back into the starting lineup in the Championship Series. He went 6-for-14 during the first three games of the World Series, hitting a go-ahead home run in Game Two. In the top of the seventh of World Series Game Five with the Giants leading the Texas Rangers three games to one, Renteria stepped up to the plate with two outs and two men on base in a scoreless game. Before going up to bat, Renteria told a teammate that he would hit a home run.11 Then he did it, slamming a 2-and-0 offering from Cliff Lee over the left-center-field wall, giving the Giants a lead they would not relinquish. Renteria was named World Series MVP, and told reporters he was happy with his Series performance because of how tough the season had been for him.12 As in 1997, Colombia planned a celebration to honor Renteria. But after a devastating flood in Colombia, Renteria called off the celebration and asked for money to be donated to flood victims. Despite his World Series heroics, the Giants did not exercise their club option on Renteria for 2011. Renteria was uncertain about retirement, but ended up signing a one-year deal with the Cincinnati Reds for 2011. He appeared in his final major-league game on September 28, getting his final major-league hit in that game off Miguel Bautista. Renteria did not play in 2012, and officially announced his retirement in March 2013. Speaking to a news organization in Colombia on the occasion of his retirement, Renteria said he was proud to have given everything on the field for Colombia.13 He finished his career with a .286 batting average and 2,327 hits. He appeared in five All-Star Games and won two Gold Glove and three Silver Slugger Awards. Renteria appeared on the Hall of Fame ballot in 2017 and received just two votes, making him ineligible for further consideration by the baseball writers. In retirement, Renteria has spent time in his native Colombia and given back to his community. He has also remained involved in baseball, serving as the bench coach for Colombia in the 2017 World Baseball Classic and the manager for Team World during the 2017 Futures Game at Marlins Park. Renteria’s place in baseball history is secure. As of 2019 he was the best Colombian baseball player ever, as well as a player with unique World Series achievements. He joined Yogi Berra, Joe DiMaggio, and Lou Gehrig as the only players with two World Series-winning hits, and joined Pete Rose, Ron Cey, and Bobby Richardson as the only players to make the last out of one World Series and win the MVP of another. Renteria’s major-league achievements are more impressive than those of any other Colombian. Though a few Colombians appeared in the big leagues before Renteria, none was as successful. He accumulated 35.2 career Wins Above Replacement as calculated by FanGraphs, significantly higher than second-place Orlando Cabrera. Renteria’s 1997 heroics inspired Colombian youth to play baseball instead of soccer.14 He became adamant that Colombia is a strong baseball nation and vocal about increasing youth participation in baseball there. In March 2018 the Edgar Renteria National Baseball Stadium opened in Barranquilla, allowing young Colombians to continue to chase their dreams of becoming the next Edgar Renteria, the pride of Colombia. This biography was reviewed by Len Levin and fact-checked by Stephen Glotfelty. In preparing this biography, the author relied primarily upon Renteria’s player file at the National Baseball Hall of Fame, Baseball-Reference.com, and Fangraphs.com. In the Notes, sources other than Baseball-Reference and Fangraphs are from the player file; pages are not available. 1 Timothy Pratt, “From Kid Hero to Ambassador, Renteria’s Game Goes Home,” New York Times, November 27, 1997. 2 “Rookie Draws Raves,” USA Today, August 26, 1996. 5 “Edgar Renteria Had Epic Season at Shortstop in 2003,” retrosimba.com, https:// retrosimba.com/2013/03/15/10-years-ago-edgar-renteria-had-epic-season-at-short/. 6 Karen Crouse, “Two Shortstops Unite Violence-Torn Nation,” Palm Beach Post, October 27, 2004. 7 George Arangure Jr., “Now It’s Personal,” ESPN.com, April 21, 2008. 8 Peter Gammons, “Boston Bothered Renteria,” ESPN.com. 9 Henry Schulman, “The Pride of Colombia,” San Francisco Chronicle, March 26, 2009. 11 Associated Press, “Edgar Renteria Named Series MVP,” November 1, 2010. 13 Juan C. Rodriguez, “World Series Hero Edgar Renteria Retires,” South Florida Sun-Sentinel, March 21, 2013.